We are pleased to announce our scholarship winner Madison Clay from Richmond, IN! Madison is a sophomore at Northeastern High School. In addition to being an all-star athlete, Madison is involved in the National Honor Society, is the captain of her basketball team, plays softball, volunteers, and is a member of the student government at her high school. She is one busy bee! In addition to her extracurriculars and athletics Madison maintains a 3.85 GPA. We recently sat down with Madison to get her perspective on the recruiting process. BeRecruited: How has BeRecruited helped you in the college recruiting process? 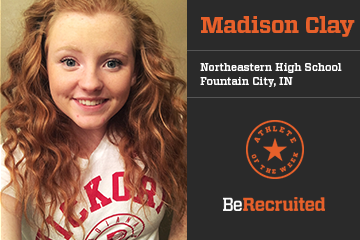 Madison: BeRecruited has opened up several doors that I would never have been able to utilize without it. I am able to provide my info to college coaches and at the same time coaches can reach out to me and see my hard work. BR: What led you to sign up for BeRecruited? MC: Knowing the college recruiting process is so intense and needs to be fully researched, I knew I needed help. I read through the BeRecruited website and quickly learned it was perfect for what I needed help with. BR: I see that you play both softball and basketball. Which is your favorite sport? MC: Basketball for sure! I am the true "BIL" (ball is life) type of Indiana girl. I like the balance of playing other sports but my main focus is on basketball. BR: Which sport do you plan to play in college? MC: Basketball. I been receiving countless hand written letters from college coaches that have seen my videos and the BeRecruited profile I have created. It's actually a motivator when a college coach reaches out to me - it pushes me to continue to improve. BR: Where would you like to play sports in college? What division, conference, type of school, etc.? MC: I am open to any and all colleges, and I am realistic about my abilities so that helps narrow things down. As long as I continue to improve and put the extra work in, I know the answer to this question will take care of itself. BR: What was your reaction when you found out that you earned the scholarship? MC: I was pumped, and still am! The money will be a great start to my college start in the fall of 2018, plus I know it will help my parents financially. BR: What are you most excited about entering college? MC: I am really looking forward to meeting new friends, striving to be become the best student I can be and graduate. If athletics is in that mix, it will be icing on the cake. You got to dream it before you live it. Madison is taking the necessary steps to becoming a committed athlete! We wish her the best of luck as she moves along in the recruiting process. Click here for a similar Q&A!